Save time and grow your sports organization with a solution that is seamlessly connected to our top-rated team app. Thousands of busy administrators, registrars and organization presidents rely on TeamSnap’s association management software to save them time. Whether you need scheduling software, a club website, help with online registration or improved communication tools, we’ve got you covered. You get the amazing TeamSnap team-level features you know and love with additional functionality for all your club or league management needs. Use TeamSnap from the web or from your phone to organize your club or league. Communicate with every team, coach and player. Easily handle registration and sign-ups. Build your website and schedule the full season. 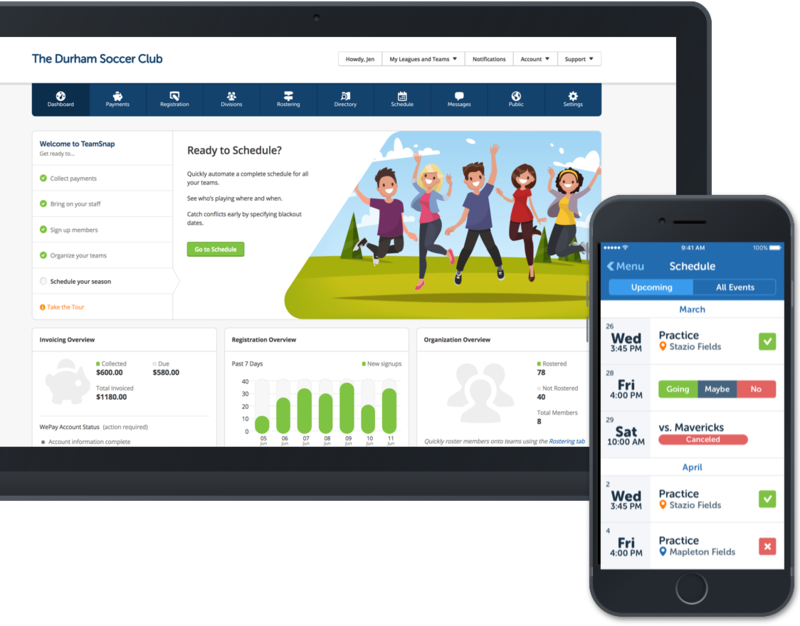 Best of all, our club software incorporates our team-based features loved by more than 15 million coaches, parents and players. Registering players, entering teams and schedules, building your club or league website and automating tedious tasks—it’s all made easy with TeamSnap. Our online and mobile apps help you efficiently manage and communicate with your entire club, league or association, even while you’re on the go. Think of us as your one-stop shop for all your club and league management needs. Whatever sport or activity you organize, TeamSnap has your back. We serve dozens of different athletic organizations for sports such as soccer, football, hockey, baseball, basketball, softball, volleyball and lacrosse. But that’s not all—you can use TeamSnap for any group activity, such as your scout troop, sales team or parent-teacher organization. If your group needs organizing, your group needs TeamSnap. Start your 21-day free trial today! No obligation and no credit card needed. Choose from a variety of flexible plans so you get the perfect features at the right price. You can even request a free demo with one of our club software experts. We’ll show you the ins and outs of our product so you can save time on the little things and get back to what really matters. Once you sign up, we offer outstanding customer support via live chat so you can get the help you need, when you need it. What are you waiting for? Get started today!